The United States Congress designated the King Range Wilderness (map) in 2006 and it now has a total of 42,695 acres. All of this wilderness is located in California and is managed by the Bureau of Land Management. From beaches to high peaks commanding outstanding vistas, the King Range Wilderness is the wildest portion of the California coast. 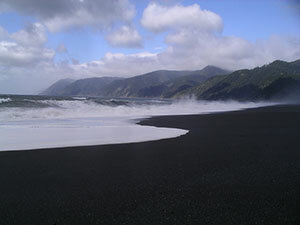 Indeed, the King Range is the longest stretch of undeveloped coastline in the United States outside of Alaska. Botanists consider the region's dune system extremely unique in that the aggressive introduced European dune grass has not yet encroached, as it has on most coastal dunes north of San Francisco. Rare coastal ancient forests of Douglas fir, madrone, and tan oak dominate the Honeydew Creek watershed. Endangered species include leafy reedgrass, California brown pelican, steelhead trout, Chinook and Coho salmon, bald eagle, peregrine falcon, northern spotted owl, and Roosevelt elk. The California Coastal Trail traverses the entire length of the area. In 2000, President Clinton designated the rocks and islands just offshore as the California Coast National Monument. Mountains, forests, streams, and coastal bluffs of the King Range Wilderness provide homes for the bald eagle, American peregrine falcon, osprey, spotted owl, Roosevelt elk, otter, gray fox, black bear, and other wildlife. Planning to Visit the King Range Wilderness? Here are some tips to help you "Leave No Trace:"
Plan Ahead and Prepare Know the regulations and special concerns for the area you'll visit. Stay on designated trails. Walk single file in the middle of the path. Do not shortcut switchbacks. When traveling cross-country, choose the most durable surfaces available: rock, gravel, dry grasses or snow. Use a map and compass to eliminate the need for rock cairns, tree scars and ribbons. Choose an established, legal site that will not be damaged by your stay. Restrict activities to the area where vegetation is compacted or absent. Keep pollutants out of water sources by camping at least 200 feet (70 adult steps) from lakes and streams. Pack everything that you bring into wild country back out with you. Protect wildlife and your food by storing rations securely. Pick up all spilled foods. Treat our natural heritage with respect. Leave plants, rock, and historical artifacts as you find them. Good campsites are found, not made. Altering a site should not be necessary. Let nature's sounds prevail. Keep loud voices and noises to a minimum. Control pets at all times. Remove dog feces from trails or camping areas. Do not build structures or furniture or dig trenches. Campfires can cause lasting impacts to the backcountry. Always carry a lightweight stove for cooking. Enjoy a candle lantern instead of a fire. Where fires are permitted , use established fire rings, fire pans, or mound fires. Do not scar large rocks or overhangs. Gather sticks, no larger than an adult's wrist from the ground. Do not snap branches off live, dead or downed trees. Put out campfires completely. Do not burn trash; pack it out. For more information on the "Leave No Trace" program and Leave No Trace teaching activities, visit the Web site of the Leave No Trace organization, sponsored in part by the Bureau of Land Management. ENJOY AMERICA'S WILD COUNTRY AND "LEAVE NO TRACE"